People often ask what is the difference between refractive lens surgery and cataract surgery. And what I say is that refractive lens surgery is really very sophisticated and detailed cataract surgery. Because they both require removing the lens of the eye. The main difference is that in refractive lens surgery we are using advanced technology lenses. And these lenses have high-quality optical surfaces – often called aspheric. They may correct astigmatism. They may also be used to correct near and distance and intermediate vision. So it’s really the quality of the lenses that is the main difference. 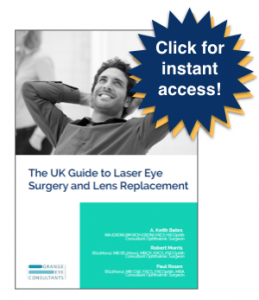 By Grange Eye Consultants|2016-03-10T16:48:56+00:00August 4th, 2016|Cataract Surgery, Refractive Lens Exchange, Robert Morris, Video FAQs|Comments Off on How does refractive lens exchange differ from cataract surgery?